SUMMARY: In the mid-17th century, outlawed Christians (mostly in the Nagasaki area) created statues of the Virgin Mary (Mother of Jesus) disguised as the Buddhist deity Kannon (Goddess of Mercy). These images, called Maria Kannon マリア観音, were made or altered to look like Kannon, but they were not worshipped as Kannon. A Christian cross was sometimes hidden within the image. Christianity in Japan was banned for over two centuries during the Tokugawa Era 徳川時代 (+1615-1867), more commonly known as the Edo Period 江戸時代. The authorities, eager to eradicate this foreign religion, executed and imprisoned thousands of Japanese Christians, and ordered all families to register with local Buddhist parishes. To conceal their faith, Christians thereafter pretended to be Buddhist lay people, yet they secretly maintained their faith with clandestine codes and ingenious adaptations. For example, Christians hid crosses inside Buddhist statues that were used during Buddhist funeral services for deceased family members. To outsiders, the memorial image appeared Buddhist, but to the outlawed Christians, it doubled as an object of Christian faith. Among some, the tea bowls in the Japanese tea ceremony were turned three times prior to drinking (to symbolize the Holy Trinity), or napkins folded in a certain pattern to instruct insiders when to silently recite a Christian prayer. Underground Christians, mostly in the Nagasaki area, also created statues of the Virgin Mary (Mother of Jesus) disguised as the Buddhist deity Kannon (Goddess of Mercy). These images, called Maria Kannon, were made or altered to look like Kannon, but they were not worshipped as Kannon. Instead, the Christians venerated these Buddhist statues by silently praying to Mother Mary. Many statues, moreover, had a Christian icon hidden inside the body or camouflaged in the artwork. During the dark years of anti-Christian persecution in Japan, these secretive methods fooled government agents and helped the Christians to keep their faith hidden and alive. Representations of Mother Mary in the guise of Kannon did not arouse much suspicion, for Kannon (as described in Buddhist scripture) can appear in many different forms, both male and female. The Kannon emerged early in the development of Mahayana traditions in India, Southeast Asia, China, and Tibet. Originally depicted only as male, Kannon in later centuries reached great prominence in China and then Japan in her various female manifestations -- those associated closely with the virtues of compassion, gentleness, purity of heart, and motherhood. In Japan, the three feminine forms of Kannon most related to motherhood are Koyasu Kannon 子安観音 (child giving & child rearing), Juntei Kannon 准胝観音 (pure one), and Jibo Kannon 慈母観音 (loving mother). These three are venerated in Japan as patrons of easy delivery and child rearing, and sometimes depicted holding a child. See Deities of Children and Motherhood in Japan. Maria Kannon statues were commonly made of white porcelain. Most were effigies of the Koyasu Kannon. 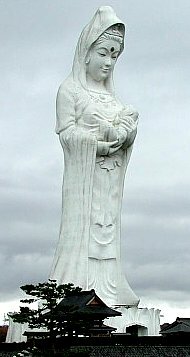 These sculptures also resembled the popular White-Robed Kannon (Byakue Kannon 白衣観音; see photos below) of Chinese origin, but with the deity holding a child. This imagery could easily double for secret veneration of the Virgin and Child. 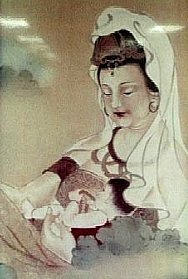 Less common Japanese images of the Kannon showed her nursing a baby. This latter form apparently appeared in the anti-Christian Edo era. It is generally considered Japanese in origin, and was supposedly developed to supplant Koyasu-sama, the Japanese Shinto deity (kami) of easy childbirth. 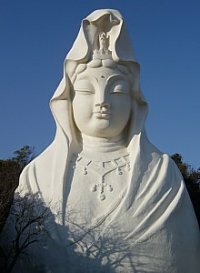 Like Mother Mary in Christian traditions, the female Kannon of Japan embodies the love and compassion of a “mother par excellence.” Even today, Kannon remains one of the most widely worshipped Buddhist saviors in Japan and Asia. In China, s/he is known as Guanyin (One Who Hears the Prayers of the World). Kannon, Amida, and Heaven. Kannon is worshipped independently in Japan, but she is also closely associated with Amida Buddha, one of the loftiest savior figures in Japanese Buddhism. Amida (lit. Infinite Life) presides over the Western Paradise. When a Buddhist dies, Amida descends from his paradise to lead the faithful back to his Pure Land of Ultimate Bliss. Kannon is one of Amida’s main attendants. In artwork, Kannon is often shown alongside Amida descending from heaven, while solitary statues of Kannon commonly include a small image of Amida in her headdress. Amida’s role as savior, moreover, parallels in part the role of Jesus the redeemer. Not surprisingly, faith in Amida was readily doubled with Christian faith during the anti-Christian persecutions of the Edo era. To avoid suspicion, Christians created Amida images that were mounted on crosses. Their veneration of this Amida cross appeared to outsiders as devotion to Amida, but it also doubled as an article of Christian faith. Work on this statue began in 1934, but the outbreak of WWII halted construction, which began again after the war and was completed in 1961. The complex here contains stones from ground zero at Hiroshima and Nagasaki, as this temple commemorates the souls of those who died in the atomic bomb attacks, and prays for permanent world peace. The temple holds a festival each September. DIRECTIONS: Found just outside Ofuna Station (near Kamakura City) on the Yokosuka train line or Tokaido train line). Photo by Allen T. Chang. resembles Catholic artwork of Madonna and Child. John Dougill. In Search of Japan's Hidden Christians: A Story of Suppression, Secrecy and Survival. Tuttle Publishing, 2012. 272 pages. Dougill is a professor of British Studies at Ryukoku University (Kyoto). Also see book review by Chris Morrison and another by the Japan Times. Mark R. Mullins, The Many Forms and Functions of Kannon in Japanese Religion and Culture. Published in the April-June 2008 issue of Dharma World. Mullins is a member of the Faculty of Liberal Arts and Graduate School of Global Studies at Sophia University, Tokyo, where his teaching and research focuses on religion in modern society. Kentaro Miyazaki 宮崎賢太郎, one of the foremost authorities on the Kakure Kirishitan (Hidden Christians). "The Kakure Kirishitan Tradition" in Handbook of Christianity in Japan, Mark R. Mullins, ed. (Leiden, Netherlands: E. J. Brill, 2003). Maria Kannon Zen Center. Christian-Buddhist organization in Dallas, Texas. See May 2005 story entitled Maria Kannon: A Focal Point for Buddhist Christian Interactions. by Jason Barthashius. Santa Maria Kan (Santa Maria Museum); a family-run museum based in Kumamoto Pref., Japan; features artifacts from 1566 AD onwards related to the secret Christians of Japan. Tel: (0969) 54-0501. Located in Ariake, a coastal town situated on the island of Amakusa, west of Kyushu, Kumamoto Prefecture. See below online database entries related to Kannon. Juntei 准胝, a form of Kannon. The JAANUS Juntei entry says: Skt. = Cundi. Also Juntei Butsumo 准胝仏母, Shichigutei Butsumo 七倶胝仏母, or Butsumo Juntei 仏母准胝. Literally Juntei means "pure" and Butsumo means "mother of the myriad Buddha and Bodhisattva." Juntei is a deity propitiated for wisdom, conjugal harmony, obtaining a child, long life, and rain. In Japan's Ono 小野 tradition of Shingon 真言 Esoteric Buddhism associated with Daigoji Temple 醍醐寺 (Kyoto), Juntei is considered a Bodhisattva (Jp. = Bosatsu 菩薩), a form of Kannon 観音, and one of the Six Kannon (Roku Kannon 六観音). In Japan's Hirosawa 広沢 tradition of the Shingon Sect and in Tendai 天台 Buddhism, however, Juntei is considered a Buddha (Jp. = Nyorai). Buddhism: Flammarion Iconographic Guides; by Louis Frederic, Printed in France; ISBN 2-08013-558-9, first published 1995; see Kannon pages 153-179. Lost Identity; by Ken Joseph; Kobunsha Paperbacks; First Published 2005, June 30; ISBN 4334933610. Japanese language. National bestseller in Japan. Explores the arrival of Nestorian Christianity in Japan from the 5th century AD onward and discusses the profound impact of Nestorian Christianity on many Japanese Buddhist traditions. Portions of the book available in English at www.keikyo.com/LostIdentity.pdf.